Chinese police got a surprise when they pulled over a brand new 4x4 for a routine check - the driver had no arms. Zing Shen, 42, was steering the vehicle with his feet and was amazed when officers decided issue him with a public safety summons.He told the traffic officers he had been driving like that for years after losing both arms below the elbows in an industrial accident. 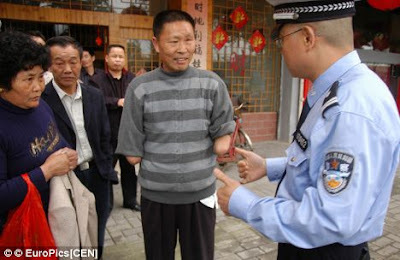 Caught red-handed: Police arrested Zing Shen who has no arms beneath the elbow but had been steering with his legs. A police spokesman in Beijing said: 'The man said that he was a very safe driver and felt he was as good as anyone else on the road, despite his disability. 'He had an automatic so did not need to worry about changing gears and said he had put a lot of practice into learning to control the steering wheel with his legs. 'He said he was actually even more careful now with driving than he had been before he lost his arms. He was surprised when we arrested him.' 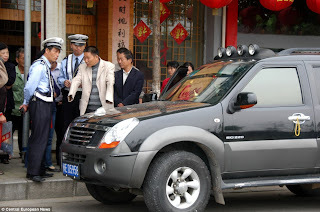 An officer in Beijing tells Mr Shen why it isn't a good idea to steer a car with his feet.